The food we eat is responsible for almost a third of our global carbon footprint . In research recently published in the Journal of Cleaner Production we ranked fresh foods based on how much greenhouse gas is produced from farm to fork. Perhaps unsurprisingly, we found that red meat is the most emissions-intensive food we consume. But we also found that field-grown vegetables produce the least greenhouse gas. For instance, it takes about 50 onions to produce a kilogram of greenhouse gas, but only 44 grams of beef to produce the same amount. We hope that chefs, caterers and everyday foodies will use this information to cook meals without cooking the planet. To produce our ranking, we compiled 369 published life-cycle assessment studies of 168 varieties of fresh produce, including fresh vegetables, fresh fruits, grains and nuts, dairy and livestock. To find out how much greenhouse gas is produced in food production, we need to look at all the activities that produce emissions on the way from paddock to the regional distribution centre. This includes: farm inputs from chemicals and fertilisers; fuel and energy inputs from irrigation and machinery for cultivation, harvesting and processing; and transport and refrigeration to the regional distribution centre. It also includes emissions released from fertilised soils, plants and animals in fields, but doesn’t include activities such as retail, cooking in the home and human consumption. In the case of non-ruminant (chicken and pork) and ruminant (lamb and beef) livestock, processes covered include breeding, feed production, fertiliser use, farm/broiler energy use including heating, as well as transport, processing at the slaughterhouse and refrigeration to the regional distribution centre. 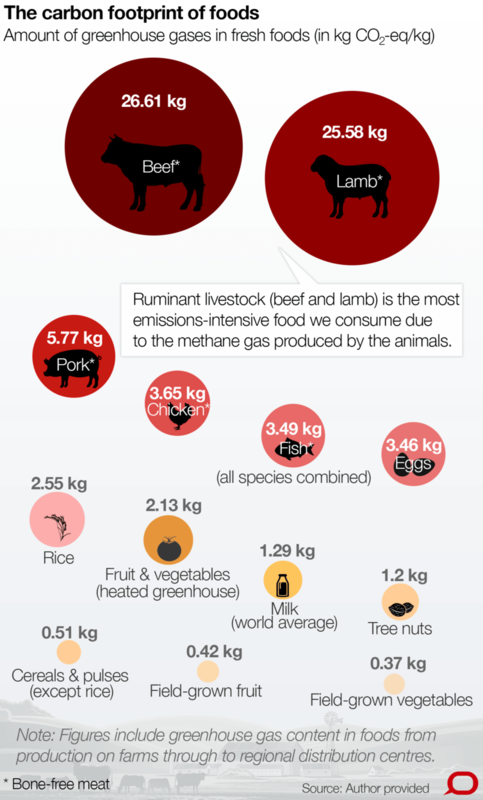 For lamb and beef the main source of emissions is methane. This is due to the fermentation process in which bacteria convert feed into energy in the animals’ stomachs. Methane can contribute anything above 50% of the total for ruminant livestock. In the case of fish, species caught offshore by longline fishing fleets and trawlers have higher values because of the significantly higher fuel consumption than coastal fishing fleets. It is difficult to compare different life-cycle analyses as these are unique to a particular growing region, farming practice, or methodological calculation. We agree there is danger in comparing one analysis with another to make direct comparisons and concrete conclusions. However, after comparing 1,800 life-cycle analysis results, we feel far more comfortable in generalising the findings. Due to different culinary and dietary requirements, it is hard to argue that you can replace beef with onions. However, it is possible to substitute red meat with other meats, or plant-based protein sources, such as lentils and nuts, that have a lower impact. Our study can help everyday citizens gain a better appreciation of the life-cycle impacts associated with the growing, harvesting and processing of food. With this knowledge, they can better plan, shop, prepare and cook food while reducing their carbon footprint. As the world grapples with the estimated US$940 billion per year in economic losses globally as a result of food loss and waste, these data illustrate the embedded carbon impacts when food is wasted in the supply chain. Our results could be used to plan menus for individuals and catering companies who want to reduce their carbon footprint, by selecting foods from different categories. Limited studies are available, however, for many popular foods. 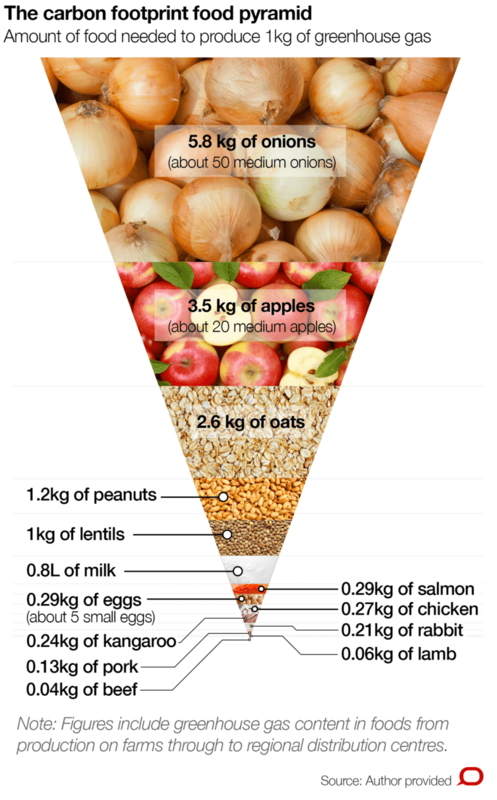 This includes tree nuts such as almonds and cashews, and quinoa, duck, rabbit, turkey and kangaroo. We need to know more about the emissions intensity of these foods as they are often presented as alternative protein sources with low emissions. The lack of published data makes emissions intensity of these foods harder to validate, and such information is critical if attempts are made to inform dietary choice for environmental purposes.